Thiruvalanchuzhi, as the name indicates (thiru-sacred, valanchuzhi-right handed curve), is a holy place where the river Kaveri takes a gentle curve hugging the divine sthala to her bosom. Adding glory to the place is the age old temple dedicated to the leader of ganas, revered in this sthala as Swetha Vinayagar or the Pure White one. Mein deity: Lord shiva and ambal. Shiva is called as Sri Kabardeeshwarar (Kadaimudi nathar) and Ambal is called as Sri Prahan nayaki (Periyanaki Ambal). But this temple is famous for the sri vellai vinayagar. Sri Vellai Pillaiyar (Swetha Vinayakar or Nuraippillaiyaar) Temple is situated at Thiruvalanchuzhi, a village located just 6 kms near Kumbakonam, Tamilnadu, India. When Durvasa Muni came to visit Indra, he brought with him a garland obtained from Lakshmi. Seeing Indra riding on his Airavatha, he offered the garland as a fitting gift to the king of devas. Indra, who was in one of his proud moods, carelessly took the garland and placed it on airavatha’s head. The elephant in its playful mood dragged it down and stamped on the holy garland. Anger burst through Durvasa who cursed Indra “Oh foolish proud King, You have just shown disrespect to Lakshmi herself. May all your prosperity melt away. May your strength disappear and may you rot in disrespect.”. Cursing thus he left the place, the devas all shivering in fear. Seeing no other go they rush to MahaVishnu and seek his help. “Divine Protector,” they pleaded, “please show us a way out”. The ever benevolent Vishnu cast his eyes on them and said “Oh Devas, you have but one way left. Churn the Milk Ocean to obtain amrutha. Intake of this divine nectar will free you from all the curse and restore you back to power”. The devas prostrated before him and left. The churning would require a huge churn support and a humongously long rope. Vasuki, the king of snakes offered himself as the rope and the devas decided to use the meru mountain as the churn. All preparations done they still couldnt begin, their strength all gone with the curse. Having been weakened by the curse, they alone couldnt churn the ocean. After prolonged consideration, Indra sent a missive to his step brothers, the asuras, asking them to join in this effort, promising a portion of the nectar. With the assent of the asuras, the churning was to begin. According to the legend, when the Devas and asuras were churning the ocean, they forgot to worship Ganesha. They realized their error when the poison came out, and Indra immediately made an image of Ganesha out of the sea foam which had collected as a result of the churning of the ocean. Ganesha was pleased, and the Devas were able to obtain nectar. This is the Ganesha present in the temple. Swetha Vinayakar, a Ganesha made of Sea Foam. Indra continued to worship the cream idol and took it with him when he went on a pilgrimage to absolve his sins. When he reached the banks of the kaveri, he placed the idol down to take a bath and perform the ritual poojas. Returning back, he saw that the idol had firmly attached itself to the ground and refused to budge. Understanding the divine will of the lord he prostrated in front of the idol. “Who am I to take you around when your desire is to stay here. All I ask is one boon. May I be allowed to perform pooja to you everyday?”, he asked. Vinayagar gave his approval, and happy with this Indra returns back to Amaravathi leaving the cream white idol to be worshipped by generations of devotees in what is now Thiruvalanchuzhi. The cream idol, adored as Vella Pillayar, Swetha vinayagar or Nurai Pillayar, in the sanctum is pure white and is protected very fiercely by silver and gold frames. No abhisheka or pushpa are offered to the deity, lest the cream is washed away. Every decoration and splendour is for the surrounding frames alone. The only offering is Pacha-Karpooram (a fine edible form of camphor), which is finely crushed and sprinkled over the image on a basis. This alone is the main offering by the devotees to the temple. Procedure To Worship or Visit Arulmigu Swaminatha Swami Temple - Swamimalai. On the other hand, just outside the main sanctum one would find a mandapa that is made up of unpolished uncut stones carelessly fitted together as though in a hurry. Legends report that once the King of the land stopped by the temple to offer his worship. Offering a plate full of abhisheka materials to the priest, he ordered “Bathe the lord in these frangrant powders and anointed waters. Let him be cooled”. The priest was caught in a dilemma. The temple required that no abhisheka be done while the king had just ordered for one. Either way he was doomed. Silently invoking ganesha he begged for help. In answer to his prayers a voice reached from the sanctum, “Oh King, I am made of cream and bubbles. Would you want me to be dissolved in the fragrant waters that you just gave?”. The king is stunned and realising his mistake he begged for forgiveness. “Then build a mandapam in front of the sanctum by sunset today to atone for your mistakes. May it remind people of the mistakes that they make in life and make them pray for forgiveness”. The king obliged and built the mandapam in the given time period, putting together rough stones into an approximate hall. The mandapam stands even today and is called the mannippu mandapam or the hall of forgiving. People who visit the temple meditate in this mandapam and ask ganesha to forgive their sins and grant them eternal bliss. The most important festival in the temple is ofcourse the Chathurthi Vizha in Aavani, celebrating the birth of the elepahant faced one. Another interesting celebration is the one in which the utsavar of Swaminatha Swami is brought from Swamimalai.The Valli Kalyanam episode of Skanda purana is then enacted out with great fervor.In this episode Ganesha comes as an elephant to scare Valli into marrying his brother Skandha. There is also this one day in a year when the temple is closed at mid day after the priest lays out all the items for worship. It is believed that Indra himself performs the pooja for the day as was the boon granted to him(One year on earth equals a day in swarga). Sakkara pongal (sweet rice with lentils) and modakam (stuffed sweet dumplings) happen to be the predominant naivedyam in the temple. The temple itself is in reality a shivasthalam (Brihannayaki sametha Khabartheesar) and is very close to Kumbakonam. A fitting visit for anyone who is looking forward to success in every step they take. May the Long bellied one (Lambodhara) give us every pleasure in life. 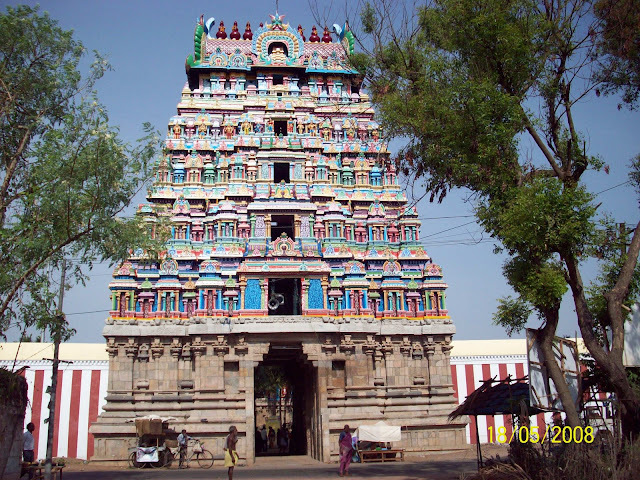 Sri Vellai Pillaiyar Temple is situated at Thiruvalanchuzhi, a village near Kumbakonam. It is easiest approached via Swamimalai from where it is around 5 Kms. 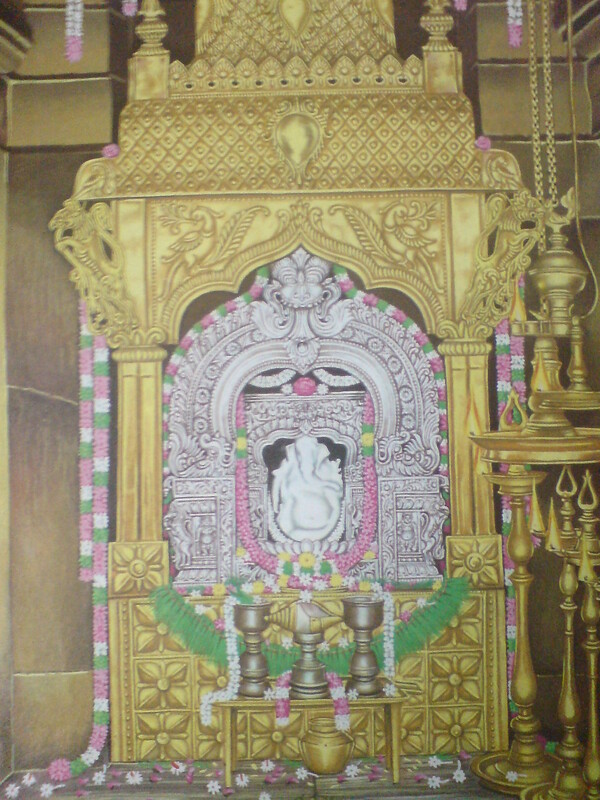 A white colored image of Ganapati - Shweta Vinayakar(Vellai Vinayakar or Nurai Pillayar) is the center of worship here.